One-of-a-kind– Rhodonite works beneficially on the heart chakra, opening one to unconditional love and increased service to mankind. It is a stone of inner growth as well, and helps with self-love. Rhodonite is also a calming stone, with energies used for easing anger as well as calming stress and anxiety. It is said to bring emotional balance, and as such bring confidence in one's life in many areas. Rhodonite is also a stone of contrasts. The pinks indicate energy that enhances love, and is used in metaphysics to attract a good mate. This stone can help one have a passionate love that is also grounded, or help mend a broken heart. 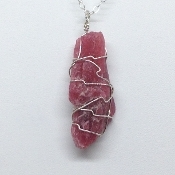 Rhodonite is a stone often used in crystal healing for healing trauma and abuse issues. Physically it has been said in crystal healing to help with emphysema, joint inflammation, ears, heaing, immune system, the pituitary gland, thyroid, light sensitivity, strep throat and heart disorders. 20" 925 silver chain, Center stone approximate size, 1.75" x .75" x .25".